According to New York University’s Daily Student Newspaper, Washington Square News, Occupy Wall Street has the power to enrich the minds of it’s students. Beginning in the Spring 2012 semester, NYU will add a course on the movement, offered at both undergraduate and graduate levels. NYU hopes that this class will encourage students to learn more about the economy and Wall Street’s involvement in it. Already lined up as a future guest speaker in the class is Susequehanna University professor Angelique Nixon. As an educator and a member of the People of Color Caucus of OWS, she believes that students should be learning about Occupy Wall Street “to get a better understanding and know about perhaps the largest social movement of the time.” She also thinks that the education about this movement will not stop at NYU, and other universities will begin to offer classes related to Occupy Wall Street. This entry was posted in New York Money, NYC Vs. Anywhere Else You'd Attend College and tagged Democrats, Economy, New York University, NYU, NYU Curriculum, NYU Newspaper, NYU Occupy Wall Street, NYU Student Newspaper, Occupy Wall St., Occupy Wall St. Class, Occupy Wall St. 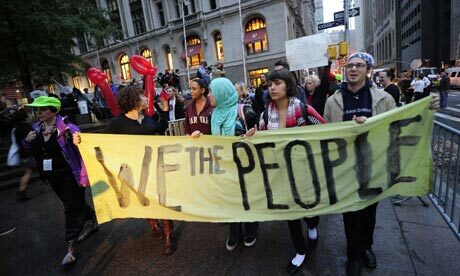 Course, Occupy Wall Street, Republicans, Study, Wall Street Economy, Washington Square News. Bookmark the permalink.